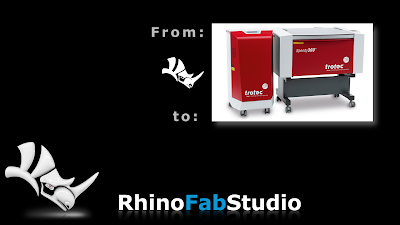 In this short video clip, you will learn what to consider when you want to send information from Rhino to a Trotec laser. What is a RhinoFabStudio? A RhinoFabStudio™ (fabrication studio) is a small-scale digital workshop, certified by McNeel, with an array of Rhino and Rhino compatible software and computer controlled tools and training. These tools cover the various leading-edge industrial methods and materials needed to design, analyze, and fabricate almost anything..